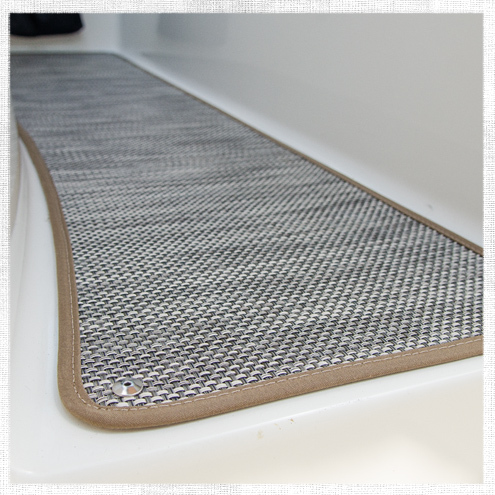 How to Replace Boat Carpet with Woven Flooring | Do-It-Yourself Advice Blog. We’re really excited to share today’s project with you because it features a brand new product we think you’re going to like. The floor covering on your boat sees a fair amount of water and traffic. Traditional boat carpeting can hold water and start to smell over time. Today we’re going to show you how to switch out that old carpeting for a hard-wearing, modern looking woven flooring. 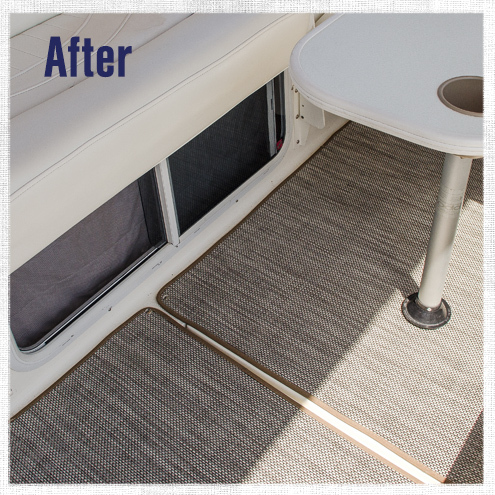 We replaced the carpeting on our Project Powerboat, a Maxum 2900 SCR, with a woven flooring from Chilewich. Chilewich Floor Covering is an innovative blend of vinyl and fiberglass woven into beautiful designs and then secured to a polyurethane foam backing. The material cuts without fraying and is easy to work with and install. Plus it’s stain, mold and mildew resistant as well as anti-static and moisture proof. Clean it off with just a spray of the hose! Chilewich is a little more expensive than competing woven flooring options, but we really like it because it is a nicer weave and more dimensionally stable. 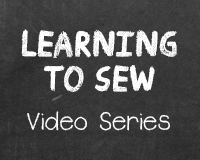 In our video, we’ll show you how to pattern and cut Chilewich for boat flooring. We also will demonstrate two different ways to finish the edges. For our boat project we opted to sew Sunbrella Acrylic Binding to the edges of the Chilewich but you can also fold the edges under to create a hem, or leave the edges raw (the material won’t fray). It’s all up to which look you prefer. You can find all the tools and materials needed to replace your boat carpeting with woven flooring at Sailrite.com. What do you think of Chilewich Floor Covering? Would you use it on your boat? Share your opinions with us in the comments! Thanks for another great video and product! You’re welcome, April. Glad you like it! I’m so glad to see you offering this fantastic product! We had Chilewich installed in our motorhome and loved it, so when we bought a boat we installed it in the salon and stateroom. It was extremely hard to find but we lucked into some remnants. People often ask us where to buy it and up until now I’ve had no good answer. I’ll be sure to direct them to Sailrite now. The woven vinyl wears like iron and is super easy to keep clean. We really like its modern yet warm look, and it’s not slippery at all when wet. As an added bonus, it is completely cat-proof and impervious to their claws, great for our live aboard feline companion. Thanks so much for your review, Louise! We certainly appreciate you sending people our way! I have the carpet that Sea Ray installed on my boat when it was new. Over the years it has been the backing that has failed. It basically disintegrated over time and fell apart. The backing on the Chilewich product appears to be similar to what I have on my carpet. What is the expected lifespan of the product if left on the floor of the boat. Does it hold water? Do I need to remove it after every outing? That is beautiful. Great idea. I would definitely so this on my boat. Could you use this on a swim raft? We need to replace the carpet and this seems like a much better choice. Hello Kathleen, it can be used on a swim raft and would be very easy to clean. The only hesitation is it may be more slippery that you would like especially if kids are running and jumping off it. I would recommend ordering a sample to begin!